The weather once again posed a challenge. 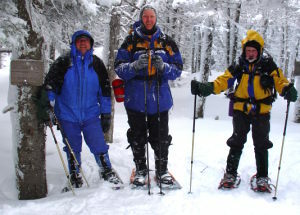 A foot of fresh snow fell on Friday night so the trip was pushed to Sunday. Myself, Ed, and Dennis decided to give it a go on this lengthy 9.6 mile trip. The road leading to Berlin Fish hatchery was plowed and fortunately, the York Trail and Brunnell Notch trails were already broken. Our goal was to go as far as possible and turn around if time and weather became an issue. Dennis is a transplant to the Barre/Montpelier area from New Hampshire. He was very knowledgeable about the trails as he is an accomplished 48-4K man. We fortunately made decent time and made the summit around 3 PM. I was also thankful for this years earlier arrival of daylight savings time, so getting down before dark became a non-issue. There were ledges and a spot where the old fire tower was that could have made for good views had the clouds and snow cover not prevailed. There is a hut .4 miles from the summit that is available for overnight stay. We were down by 5:30 and extremely tired but glad to have bagged the peak.